Mortimer Death was featured in a short-lived series of at least four stories, possibly more, from 1940-41 in the pages of Detective Fiction Weekly. The author’s byline was Bennett Barlay, a pen name well-known to have belonged to Kendell Foster Crossen, (1910-1981). Other pseudonyms include: M. E. Chaber, Richard Foster, Christopher Monig, and Clay Richards. The main character in these stories hands out business cards that read: Mortimer Death, Mortician. He is a “short fat guy, with one of them rosy, cherubic faces and the kind of a smile you use to win friends and influence people.” He introduces himself to two police homicide detectives in the first story, “The Case of the Happy Undertaker,” and tells them he wants to help them solve a murder case, and that he has an instinct for violence and death. He immediately proves his worth by convincing the police that what appears to be the deaths of two men by pistol dueling is in reality murder. Besides Mortimer Death, the only regulars in the series are the two men from Homicide, Sergeant Stuart and Detective Matson, who seem to spend an inordinate amount of time playing cards instead of working. The other three stories in the series are fairly common light mysteries, with a bit of humor involved. They are all of short story length. In “The Red Rooster of Death” a famous writer is murdered, and no sooner than Sergeant Stuart and Detective Matson arrive on the scene than Mortimer Death shows up. Within a short time he fingers the murderer for the police. “Prest-o Change-o Murder” involves the murder of a magician whom the police are supposed to be guarding. Mortimer Death is also present, and reveals his interest in magic tricks. When the magician is murdered, Death easily solves the case. In “Too Late for Murder” the police investigate a supposed murder that the victim’s doctor claims never happened. 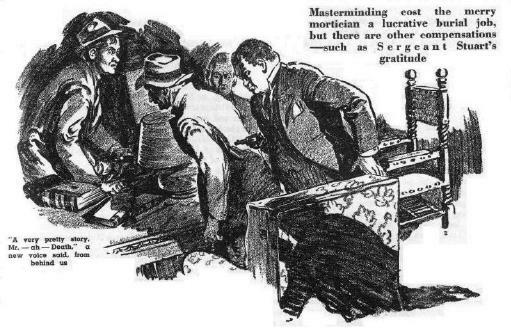 However, the victim is dead anyway, and Mortimer Death has been called in as the undertaker. He solves the case, thereby doing himself out of a fee. 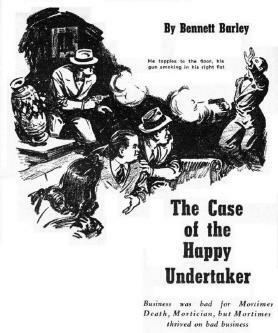 “The Case of the Happy Undertaker” Detective Fiction Weekly, February 3, 1940. “The Red Rooster of Death” Detective Fiction Weekly, August 10, 1940. “Prest-o Change-o Murder” Detective Fiction Weekly, April 12, 1941. If there are more in the series, we would like to know about them! And for a list of many other books and stories taking place in Funeral Homes and/or in which Undertakers are also sleuths, go here.